Part of the Romeo family by artist Philippe Starck, the Romeo Outdoor C3 moves the eye upwards with a balanced refinement. The outer diffuser is made by weaving colored PVC tube compound with the polyester painted, phospho-chromated aluminum inner tubular frame. The inner diffuser is opal colored, vacuum-formed PC (polycarbonate) that can be removed without tools when the bulb needs to be changed. The diffuser support in anodized and painted die-cast aluminum alloy. 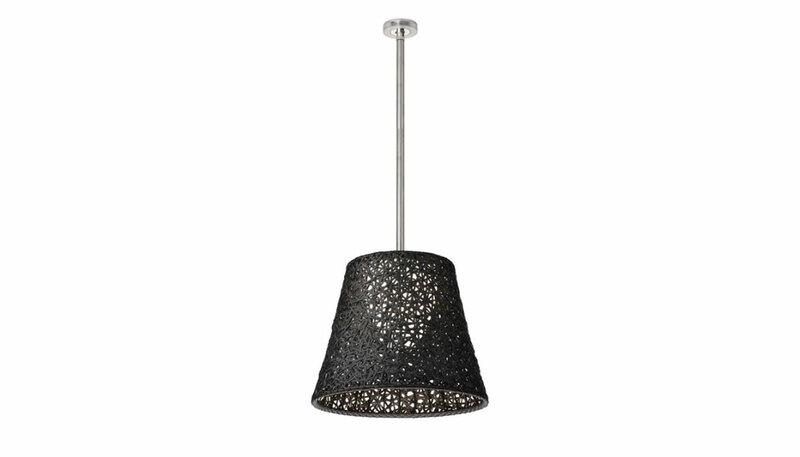 The ceiling fitting is die-cast aluminum alloy with a brilliant finish. There is an injection-molded PC (polycarbonate) cover rose. The polished steel stem is 31.5". All painted details have undergone a galvanic phospho-chromate treatment for enhanced corrosion and weather resistance. Manufactured by Flos.